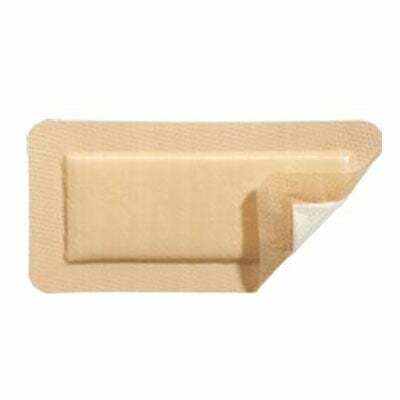 Molnlycke Mepilex Border Post-Op Self Adherent 4" X 12" 5/bx 295900 is an all-in-one, foam dressing that effectively absorbs and retains exudates, maintaining a moist wound environment. Molnlycke Mepilex Border Post-Op Self Adherent 4" X 12" 5/bx 295900 is an all-in-one, foam dressing that effectively absorbs and retains exudates, maintaining a moist wound environment. The Safetac® layer seals the wound edges, preventing the exudates from leaking onto the surrounding skin, thus minimizing the risk for maceration. The Safetac® layer ensures that the dressing can be changed without damaging the wound or surrounding skin, or exposing the patient to additional pain. Minimizes pain and trauma at dressing changes. Self-adherent, no secondary fixation needed. May be used under compression bandages. Promotes patient comfort during wear. May remain in place for several days depending on the condition of the wound. Consists of a soft, silicone, wound-contact layer, an absorbent pad in three layers, a polyurethane foam, a nonwoven layer, a fiber mixture with super absorbent polyacrylate fibers and an outer film that is vapor permeable, moisture and bacteriaproof. May be lifted and adjusted without losing its adherent properties. Low potential for skin irritation and allergy.